Hey thanks for stopping by today! 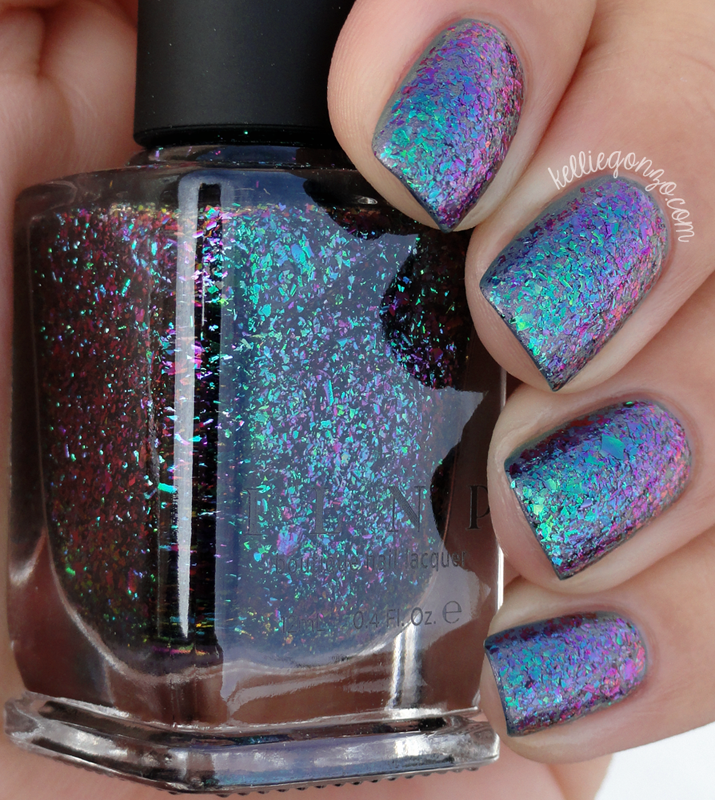 I wanted to show you an awesome new polish from boutique nail brand ILNP (I Love Nail Polish). It's my first bottle of their polish with their new formulas and their brand new chic-as-hell bottles. They are a hot ticket right now, very popular in the nail polish world. This is Supernova, one of the new shades from their 13 piece collection of Ultra Chrome Flakie polishes. These are seriously magnificent. They have an awesome color shift and can be worn layered over any color, not just black like traditional flakies. This has an awesome range of colors reflecting in it, you can see blue, teal, green, purple, and a little bit of red and gold on the edges. I layered two coats over Nubar Indigo Illusion. In the shade photo you can see another aspect of the color shift. Trust me when I say that I couldn't even come close to capturing how awesome this is in real life. You need to see them with your own eyeballs! They lay nice and smooth on the nail too, in case you are interested, little to no texture.